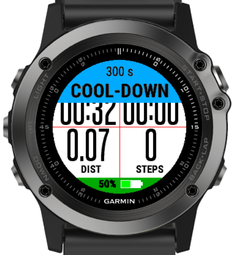 The Interval Training App Professional offers several interval training features for indoor and outdoor use. In order to use these features, please configure them properly before. This can be configured in the PREMIUM version via app settings as illustrated on the left side. Intervals start with a recovery phase (due to user feedback). If you don´t like that, please subtract that time from the warm-up time. Before an interval training it is strongly recommended to perform an adequate warm-up in order to avoid an injury. 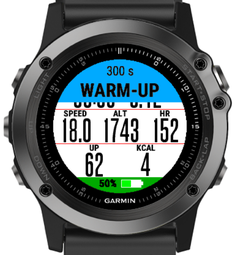 If this phase is enabled (warm-up trigger selection is time- or distance-based), then the warm-up phase is indicated a few seconds after start via vibration, tone (for watches which support this) and light as graphically as shown in the figure below. On top, the time respectively distance for this phase is shown in seconds respectively meter/feet. 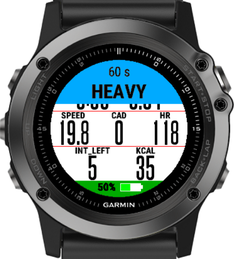 This phase can be disabled via trigger configuration or skipped when pressing the <BACK> button on your watch. After the recommended warm-up, an interval training always starts with a RECOVERY intensity phase where the time or distance can be freely configured. This phase is indicated via vibration, tone (for watches which support this) and light as graphically as shown in the figure below. On top, the time respectively distance for this phase is shown in seconds respectively meter/feet. 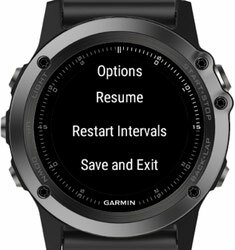 This phase can be disabled via trigger configuration or skipped when pressing the <BACK> button on your watch. After the high activity phase a MODERATE activity phase follows. The time or distance can be freely configured. This phase is indicated via vibration, tone (for watches which support this) and light as graphically as shown in the figure below. On top, the time respectively distance for this phase is shown in seconds respectively meter/feet. This phase can be disabled via trigger configuration or skipped when pressing the <BACK> button on your watch. After the moderate activity phase the HIGH intensity phase follows. The time or distance can be freely configured. This phase is indicated via vibration, tone (for watches which support this) and light as graphically as shown in the figure below. On top, the time respectively distance for this phase is shown in seconds respectively meter/feet. This phase can be disabled via trigger configuration or skipped when pressing the <BACK> button on your watch. After an interval training it is strongly recommended to perform an adequate cool-down in order to avoid an injury. 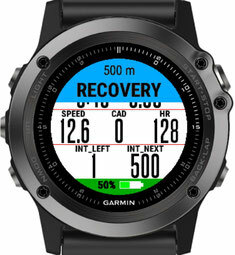 If this phase is enabled (warm-up trigger selection is time- or distance-based), then the warm-up phase is indicated 5 seconds after start via vibration, tone (for watches which support this) and light as graphically as shown in the figure below. On top, the time respectively distance for this phase is shown in seconds respectively meter/feet. This phase can be disabled via trigger configuration or skipped when pressing the <BACK> button on your watch. After an interval training a menu is shown where the user can decide how to continue as shown in the figure below.